When that little bundle of joy enters your world it’s hard to imagine that you could ever get angry at them. But inevitably it happens, there’s no getting around it. It’s no secret that kids can push a parent’s buttons. Whether it’s a toddler that won’t clean up their blocks, or a teenager that mouths off, angry parenting is something that many of us have been guilty of. Life is full of stressful situations. Between work, household issues, and adult relationships, even marriage problems, a child who is misbehaving or trying your patience can feel like the last straw. No matter how hard you try to keep calm it’s possible for even the best of us to snap and before we know it we are angry and effective parenting goes out the window. So how can we avoid angry parenting, or at least temper our anger? We all get mad at our kids sometimes. There’s just no way to avoid that. When you share your life with someone, whether it’s your parents, your spouse, or your kids, you will find yourself occasionally getting angry at them. Kids, however, have unique ways of provoking their parent’s anger. Often our anger in parenting comes from a place of both love and fear. The love a parent feels for their child is strong and hard to describe. And, when we see our child (ren) doing something that could put them in harm’s way, we react strongly out of worry for their safety. Consider the child that gets lost at the grocery store. A parent who can’t find their child in a crowed area of any kind is likely to become frantic and, upon finding the child safe, may very well become angry and lash out with, “Why did you do that? !” or “I told you not to wander off!” or “Don’t you ever do that again!” This is an intense, emotional anger that is aimed at both the child for disobeying, and at ourselves as a parent for having allowed them out of our sight. To complicate things even more, relief and love are equally as prevalent in this scenario. Unfortunately, what your child sees most is likely to be the anger. We also often get angry at our kids for, well, being kids. Adult logic and order doesn’t resonate well in a child’s mind. We may give instructions expecting them to be followed to our expectation, but from a developmental stand point a child may simply not be capable of doing that. If we are in a hurry or bogged down by other issues, it’s easy not to stop and think about how they are processing your instructions and not let our anger get the best of us. In the blink of an eye we are yelling, scolding and parenting out of anger. As adults and parents we feel that it is our responsibility to control our children. We hear that all the time, don’t we? “She should get her kids under control,” or “Those kids are out of control.” The mistake many of us make is assuming that we can “control” anyone else’s behavior. This mistaken belief is a large source of parental anger. As parent’s we teach, we guide, we discipline when necessary, but can’t actually MAKE anyone – even a child – do something. The frustration we feel when a child disobeys, doesn’t listen, or is acting out can cause us to get angry and begin to attempt even harder to control through yelling and angry words. At this point the child is actually controlling our actions through their behavior rather than the reverse. This can be an even more difficult situation if a parent has anger management issues to begin with. There are some who may even lose control all together and become verbally abusive. In these cases intervention in the form of counseling or anger management for parents may be needed. Parenting is one of the most common situations where the need for anger management shows up. I've worked with many men (and women) whose anger has caused them to physically threaten their kids, intimidate them by a physical action such as throwing something, or who've actually gotten physical by shoving or hitting their child. Sadly, anger management problems for parents can easily turn into physical abuse of their children. No parent wants to do this, but it's not hard to do when you already struggle with anger and you're parenting a difficult child. Our kids can become a mini-me, so if your anger puts you at risk of crossing the line with your kids please do something about it." No one is suggesting that your goal should be to NEVER get angry at your child, that’s not realistic. But maintaining control of your actions rather than focusing on controlling theirs is important. Your reactions to their behavior will either escalate or de-escalate the situation you’re facing. In other words, your calm, firm, and loving response will be more effective at changing their behavior than an angry one. If you find yourself parenting out of anger you’re not alone. It happens to all of us at some point. It’s important to remember, however, that your angry reactions are not the fault of your child. That can be hard to recognize and remember, after all we wouldn’t be angry if they weren’t behaving the way they were, right? How you handle your anger as a parent is up to you and figuring out how to do that can be difficult. As parents we have to recognize that a child’s view of themselves comes from how we treat them. We are effectively a mirror and the reflection we show them of themselves is the one they will come to believe. Constant angry reactions, harsh words, or verbal abuse can result in lowered self-esteem and potentially many other problems as they grow. A consequence of parenting when angry can be that we do to damage our children, often in ways that aren’t evident right away. 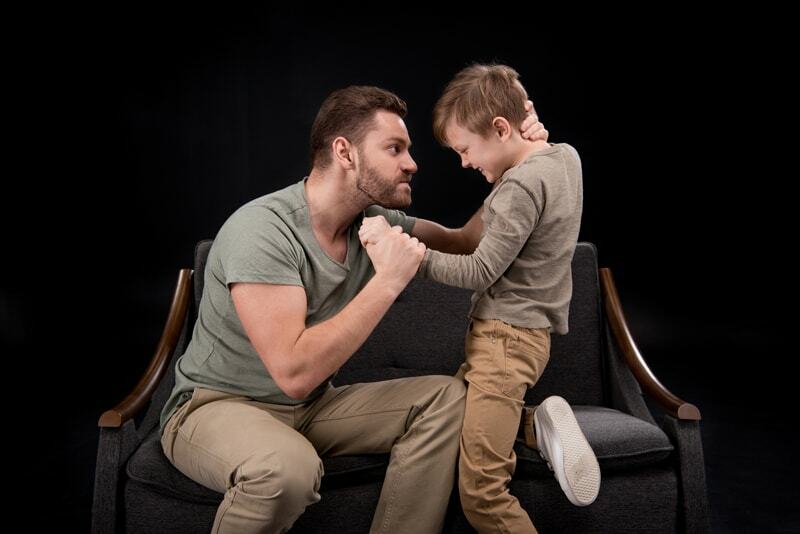 When a parent lashes out at their child they are not only potentially damaging their child’s self-esteem, they are also teaching a child what they should do with their own anger when they experience it. This can increase the likelihood of a child having anger issues that manifest on the playground, within their adult relationships, and even their own children if they have them. If you are having problems managing your anger as a parent there are steps that should be taken to remedy that. Anger management classes aimed specifically at parenting are a good start. And, working with your spouse or parent partner to help you cope and manage your anger is crucial. So how can we more effectively manage our anger as parents? Start with some of the steps below in order to try and avoid angry parenting. Understand that these may not be all that needs to happen, but they are a start. Try to think like your child. Children aren’t able to stop and think like adults, but as adults we are able to stop and try and put ourselves in our child’s place and understand their perspective. Try considering why they are acting the way they are and what they may be hearing you say. What they hear is not always the same thing that you are trying to convey. Speak calmly, act calmly. Your calm approach is more likely to elicit a calm response in your child. More importantly, an angry response from a parent will definitely result in negative feelings and behavior in your child. Choose your battles. Raising children presents many opportunities for conflict and anger. Jumping on every single one of them will make everyone miserable. Sometimes as parents we have to learn to let certain things go in order to avoid becoming a constantly angry parent and creating an unhappy environment for your family. If you discover that you still need more help to handle your anger at your children then you need to seek additional support. The help of a qualified counselor or classes for managing parental anger can be very helpful. Angry parenting will happen so preparing yourself ahead of time for handling those situations is important. Ensuring that your child is clear about expectations and boundaries before there is a reason to get angry will go a long way toward not arousing anger in the first place. If you find yourself constantly struggling with anger as a parent, however, seeking the help and support of those around you is a wise idea. Anger management classes for parents is also something to consider. Ultimately, the goal is raising a healthy, happy child who understands respect, responsibility and how to be a kind person. This isn’t an easy task and, as parents, we will be tested over and over again. And, as they say, kids don’t come with instructions, so we all have to look for support when needed and remember how much we love them as we guide and teach them how to be the best people they can be. Why Do Men Seem To Need Anger Management Classes? My Anger Is Making Me Verbally Abusive - What Can I Do?